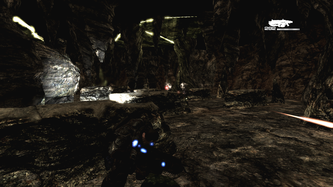 “Fed Up” is a Gears of War, single-player level that explores the theme, jumping into an Emergence Hole and taking the fight into Locust territory. 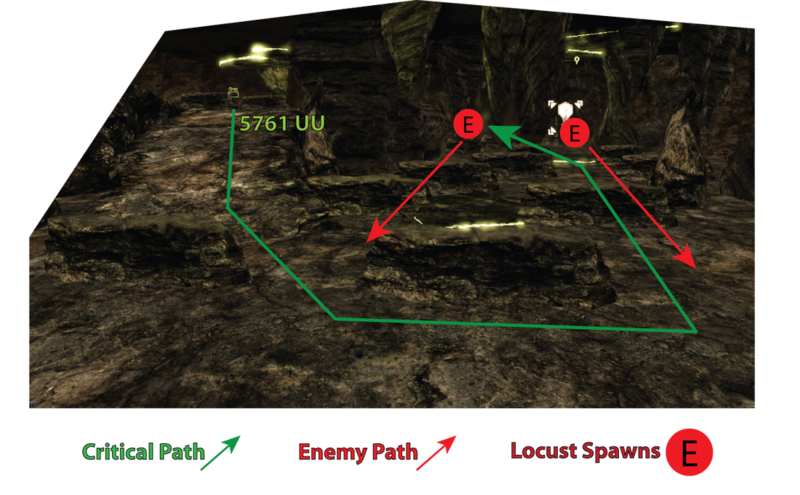 The design goal of this level involves placing the player into several underground caverns to simulate the creator’s interpretation of inside an Emergence Hole. 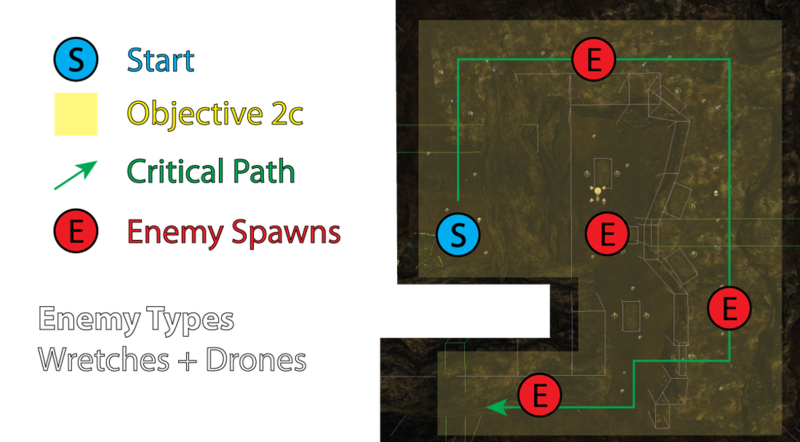 This culminates in an intense firefight, in which players pop out of the Emergence Hole into an interior building to save the lives of several Stranded fighting a horde of Locust Drones. 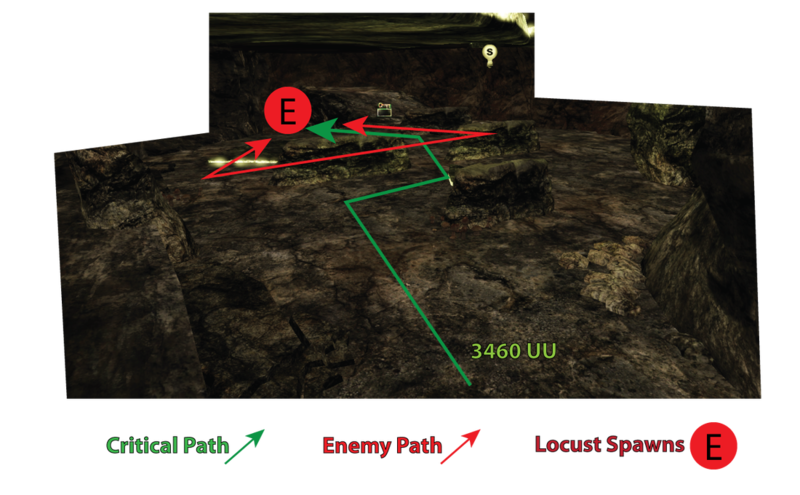 The location takes place in the Nassar Memorial Park region, during the events of Gears of War. 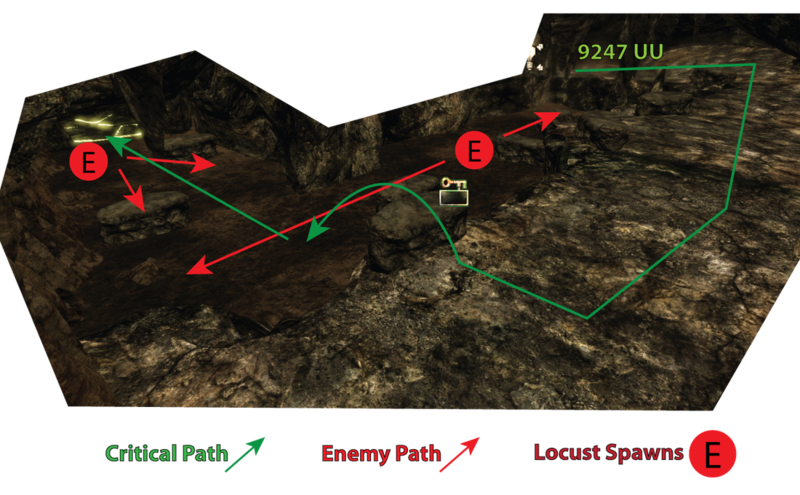 The focus for “Fed Up” involves randomizing the layout of several pre-built underground caverns, so that the order of the Emergence Hole layout provides a unique experience each playthrough. 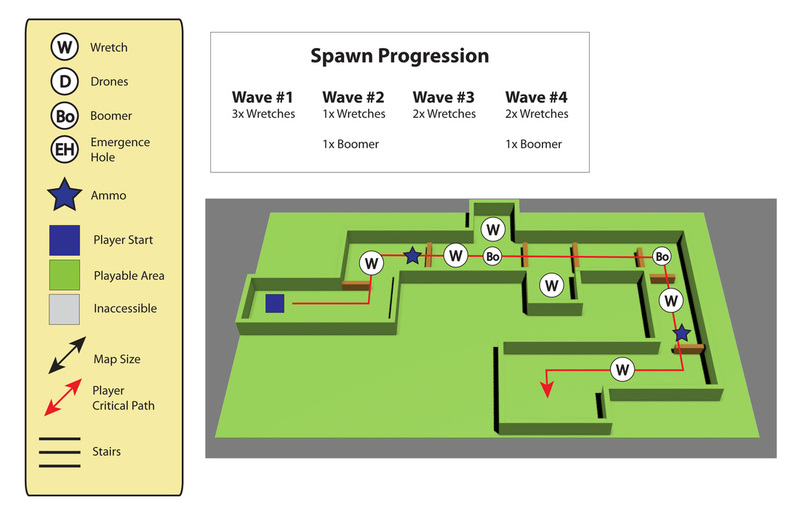 To create a system where rooms could be randomly chosen and played through, during each run-through of the level by players. The main ambition behind this was to provide replayability to this level, while also keeping the gameplay fresh and mysterious. 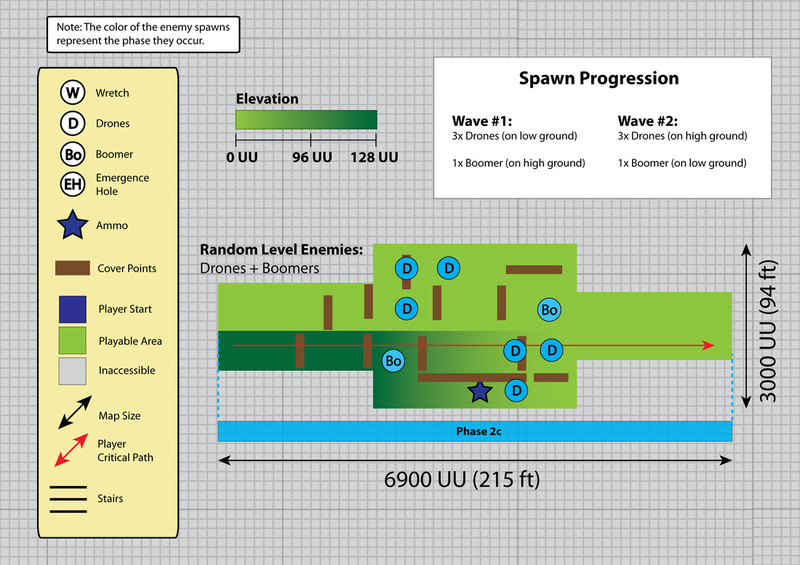 Since this level was designed to be inserted into the middle of a Gears of War campaign, I wanted the ability to insert multiple sections easily, and have the randomization work in any context. To that end, it was highly successful, by using different boolean variables, and using it as comparison platform, I could easily have multitudes of sections that can be randomly selected, without being too cluttered within Kismet. 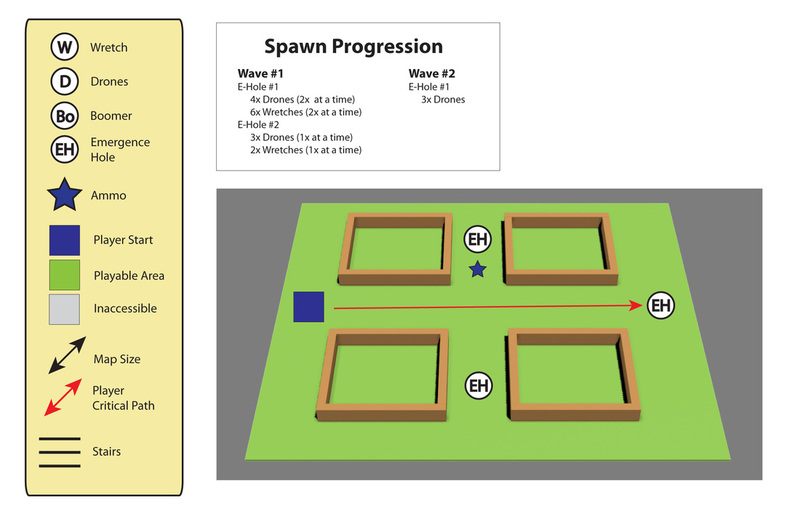 How the system works ended up being quite simple, per my goal to make it less cluttered in Kismet, and easy to add in multitudes of rooms (for future expansion). 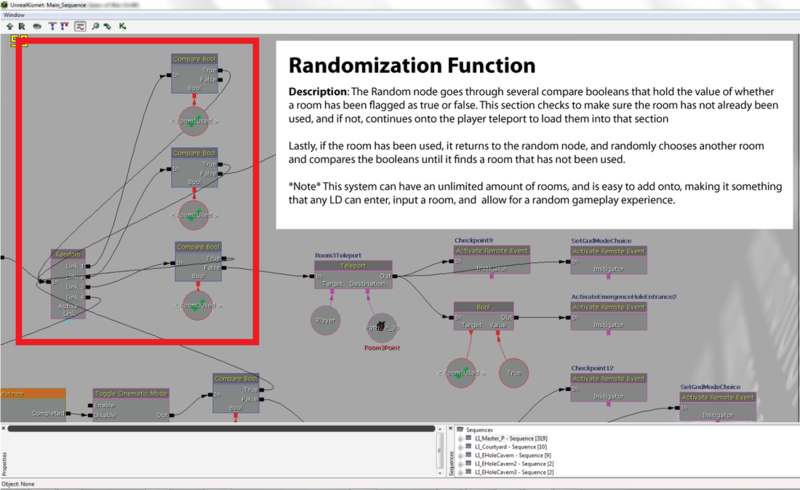 One of the challenges was organizing it within Kismet, in terms of readability, and Remote Events were used extensively to provide different event / gameplay scripts, while keeping things clean. 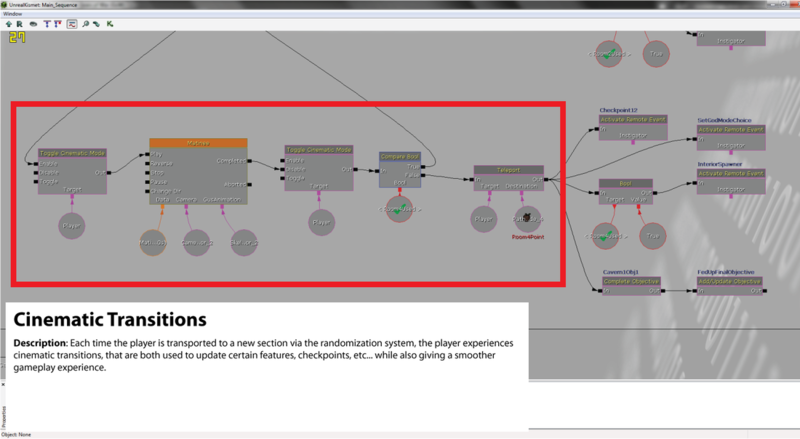 These animations were pre-built, and used in multiple situations, some cases repeatedly, in order to make sure transitions were where they needed to be to provide some form of context to players. 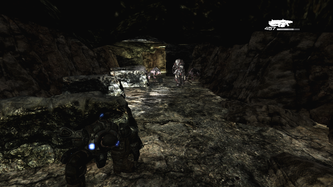 First to introduce the player to the level, as well as the visuals, this section plays out like a standard Gears of War level, with enemies coming out of emergence holes. 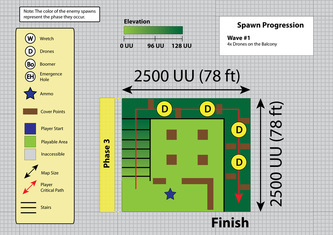 Introduce players to Gears of War, and setup up the level / environment setting. 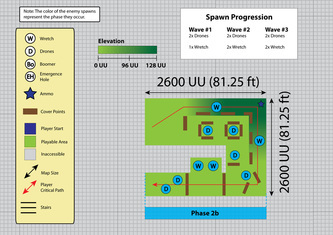 Designed to be placed directly into a Gears of War section from the original campaign. 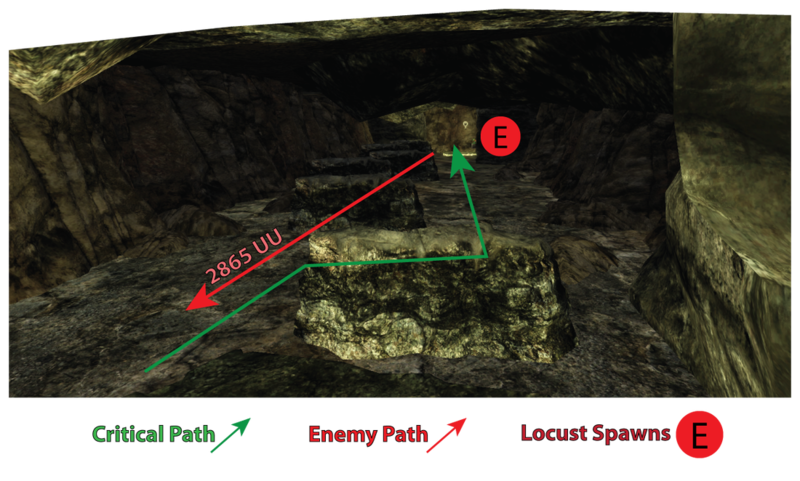 This section provides some initial combat, and gives context to why players are jumping into the Locust tunnels. 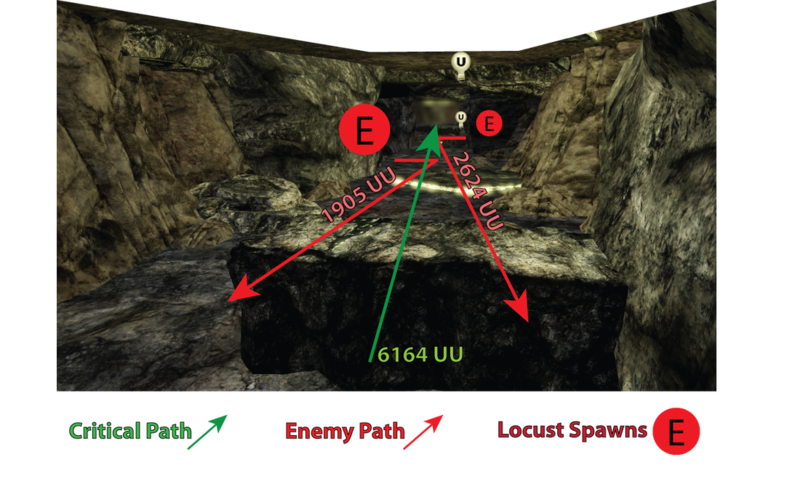 Design Goals: Familiarize players to Gears of War, and let the players go "ooo, I get to explore the tunnels /excited??" 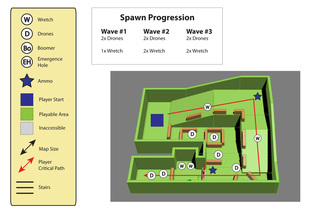 These sections represent the technical and gameplay highlight of this level. 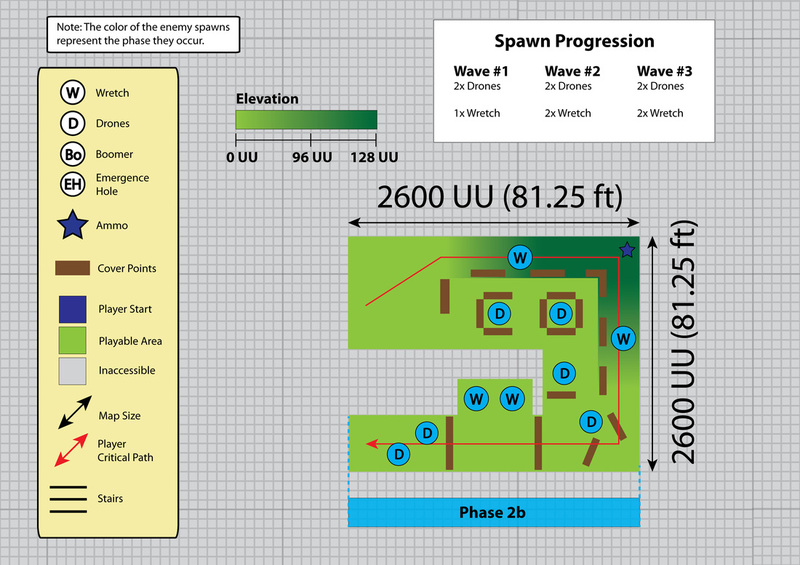 Each of these sections is chosen randomly during each unique playthrough, and occur in different order. Section 2a is one of the random sections within the middle portion of the game. 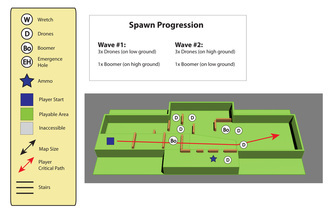 It focuses on short range and long range combat, using Wretches for corner ambushes, and Boomers as towering obstacles. 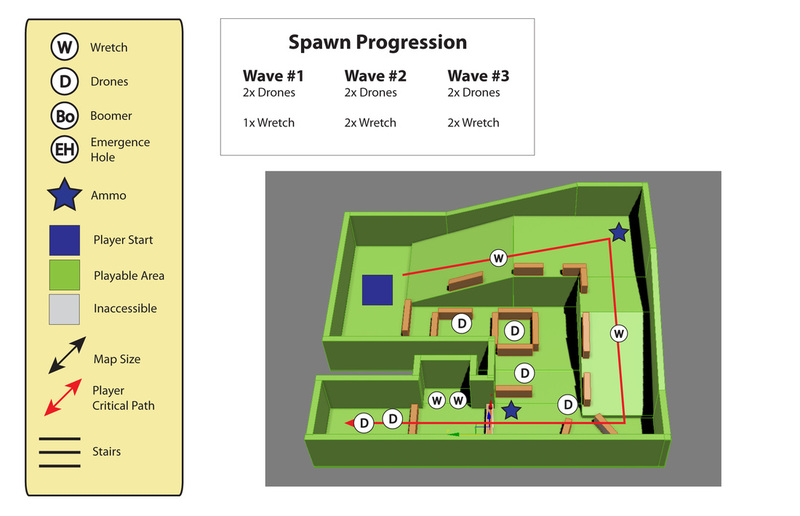 This is the first hallway section of the level, where I wanted players to have multiple side rooms where Wretches spawn to ambush players. And also the feeling of tight quarters in a tunnel, to provide that "Locust Tunnel" feel. The last section of the "L" shape hallway. 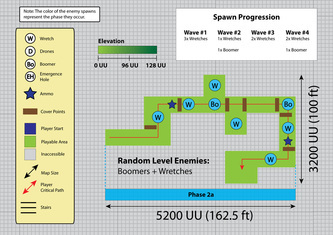 Where the player must fend off a Boomer, while contending with Wretches. 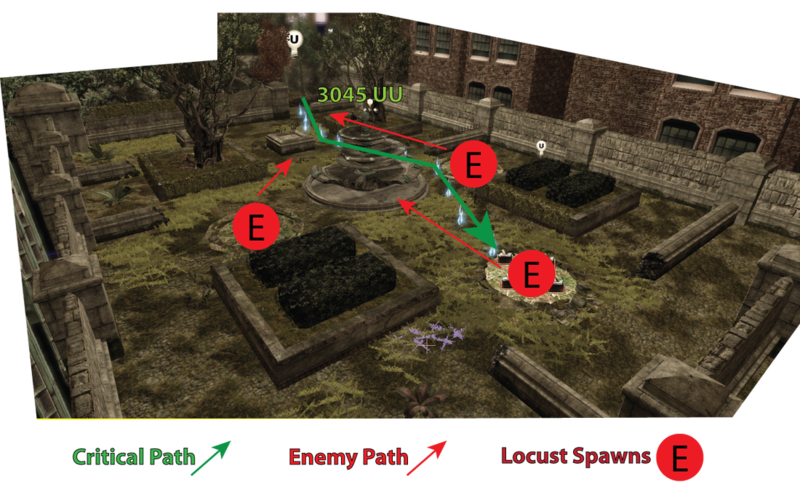 One of the challenges was to not be repetitive, like the previous hallway, so I decided to mix in cover, and show that players were moving closer to Locust "presence". 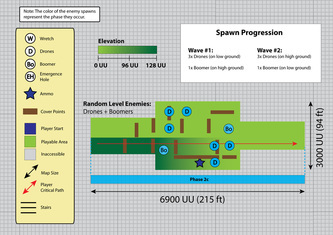 Section 2b, is yet another random environment location. This time, I went with the "U" shape layout, with more emphasis on long-range combat. 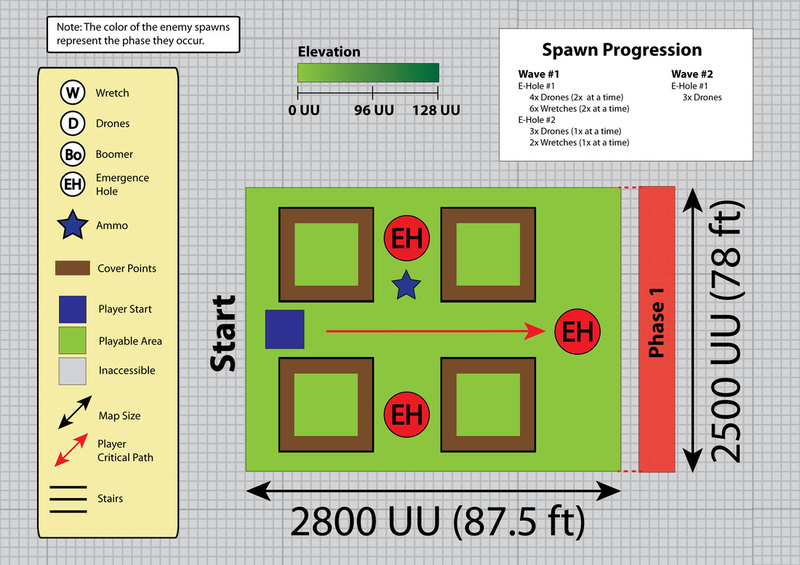 I wanted the first encounter, whether this map took place first or last, to be challenging, but paced properly. 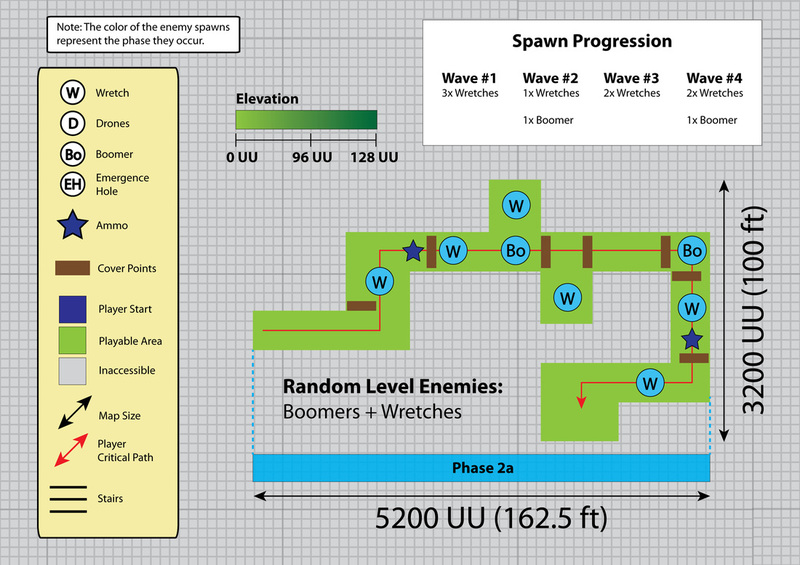 To that end, I placed a Boomer as a sort of "mini-boss", due to the close quarters, and limited amount of cover. 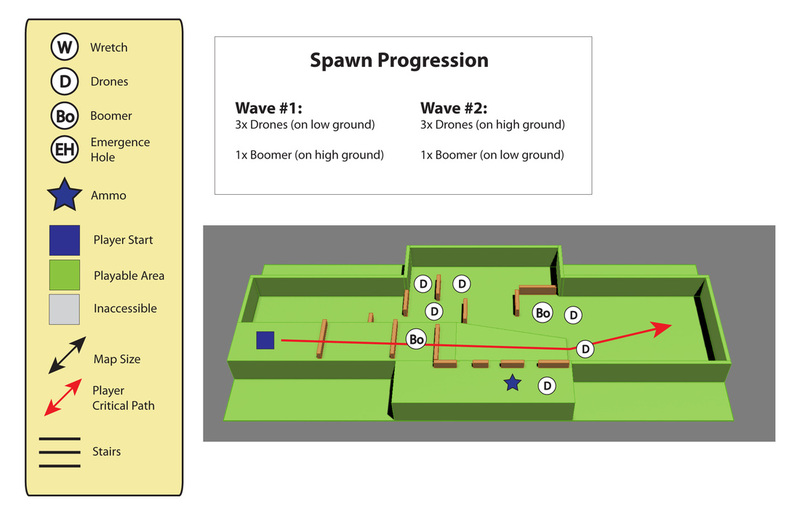 I imagined this area as a way to convey my strong suit as an encounter designer, with more open space for combat against locust, with emphasis on cover, movement, and flanking, as shown by the wider play-field, and multiple attack angles. Section 2c, was my attempt and homage to the shower scene from "The Rock". 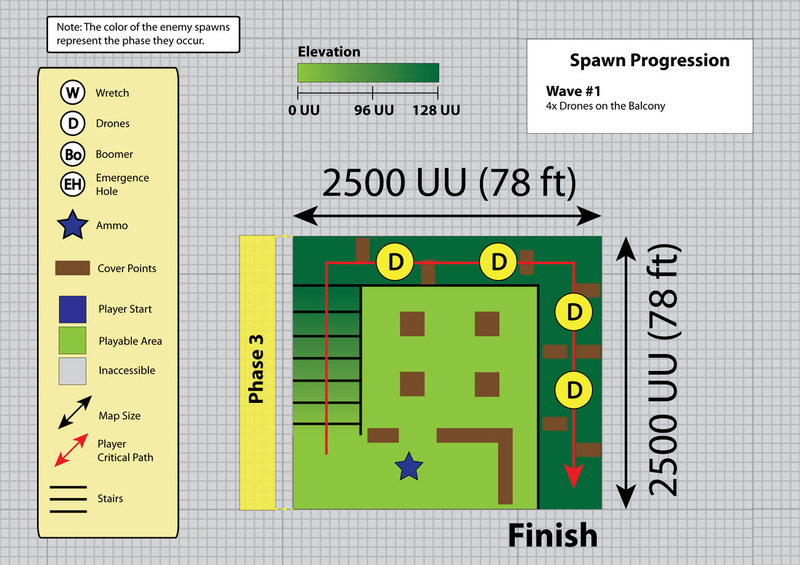 The player however plays the "villains", and are the ones to attack from above down onto an unwary group of Locust. 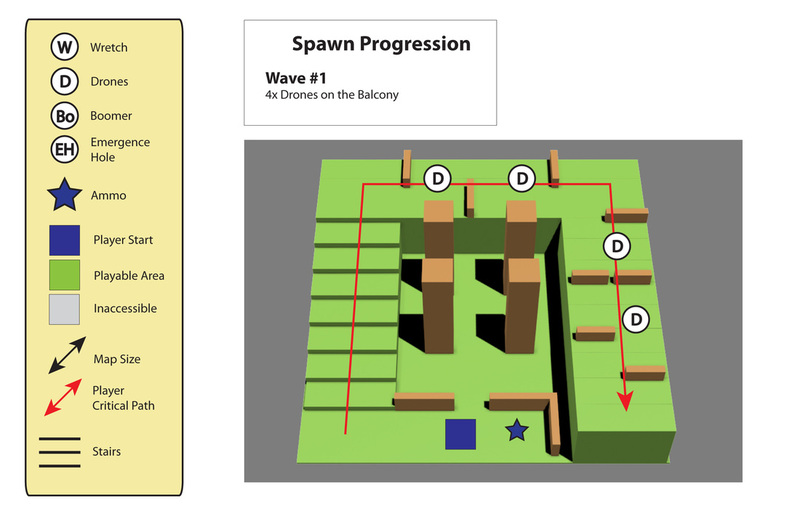 However, to add some challenge, players much also contend with wretches that have found their way onto the 2nd floor ledge. Honestly, there's no real design decision here, other than its a ramp. Go up it please! :) The picture here is for continuity purposes. The biggest challenge in this location was pushing the player to the cover location where players can mount and jump over the rock to get down to the bottom floor. 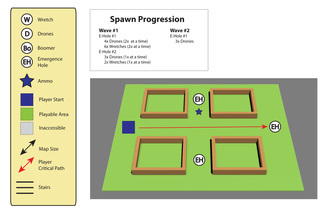 In the end, I used multiple methods to grab their attention, from displaying text, sounds, and also objective marker. The lobby focuses on an intense indoor firefight between Locust and Stranded soldiers, with the player interjecting during the fight, and being placed in a situation where they can defeat the Locusts to save the Stranded soldiers. 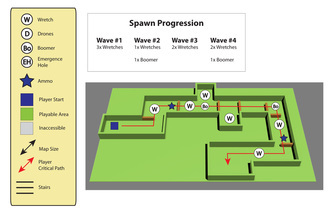 A part of this level emphasized a final combat zone for players, with also the added ability to have it be inserted into the middle of the Gears of War campaign, as a segue into the rest of a "theoretical" professional level. 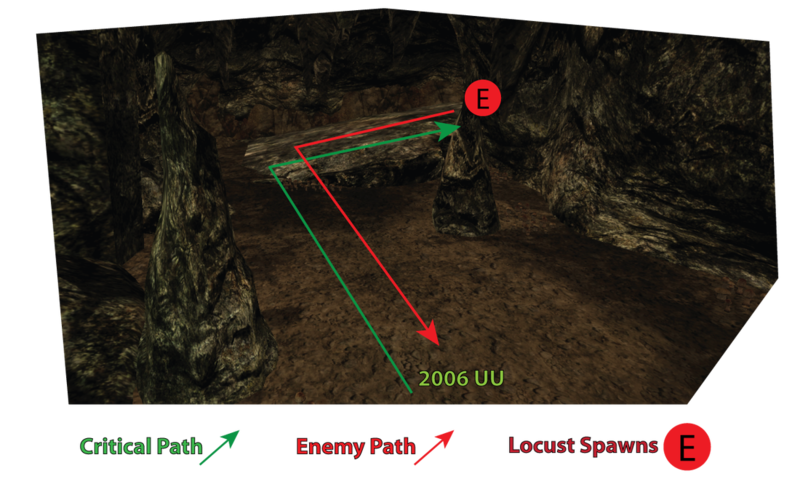 The final area for the entire level sequence, I wanted players to have a final show-down with Locust, in a tight indoor environment. 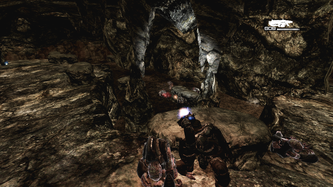 Not only that, I wanted players to have that feeling that they popped out of the Locust Tunnels straight back into the fight on the surface. Charge! Is how I want people to feel. 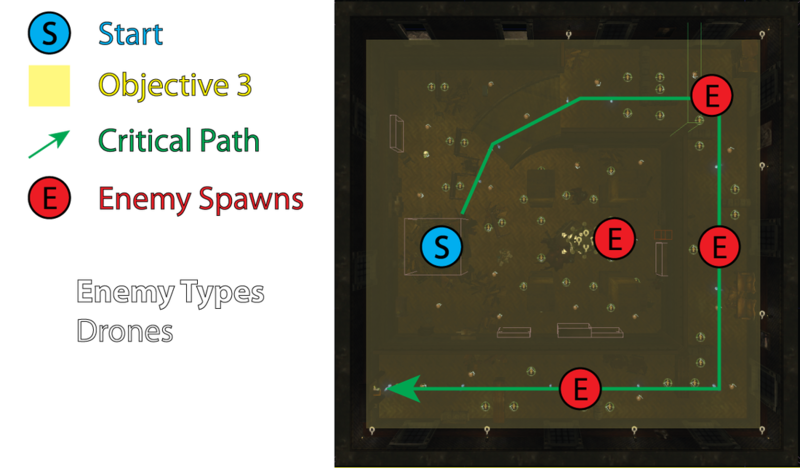 One of the biggest challenges was to provide all the context to players of where they are, their new environment, etc... while also making sure they don't get bum-rushed as soon as they spawn. to this end, I left plenty of cove in the form of destroyed furniture near the EHole entrance (exit). 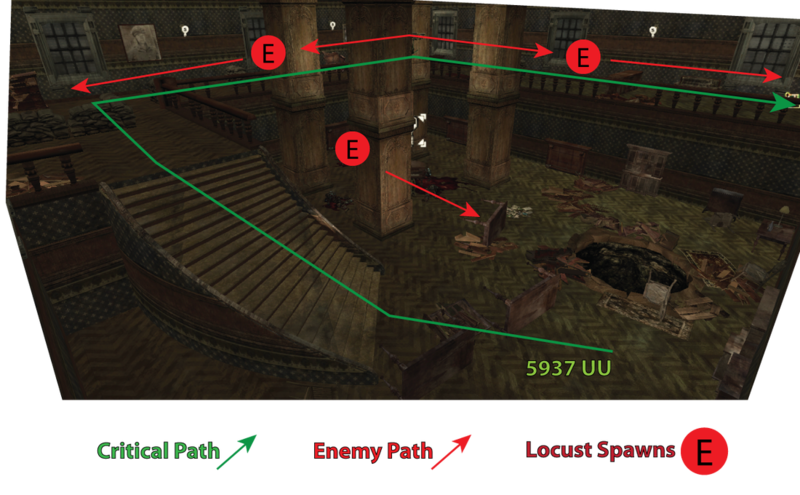 Also, having most of the Locust provided more of an urgent situation, while the pillars provided enough LoS for players to survive until they made it up there.